The Central Naval Museum is one of the oldest museums in Russia and one of the largest of its kind in the world. It originates from the Model Chamber, founded by Peter the Great in 1709. Initially it was a drawing workshop where all the ship models and drawings were kept. In 1805 Alexander I signed the order concerning foundation of the Sea Museum based on the Model Chamber collections. In the new museum not only collections of ship machines, books and rarities were stored, but also the most modern navigation tools for Russian sailors were collected. When the Admiralty library was included in the collection of the Sea Museum, it became the largest cultural fleet center in Russia. Such outstanding seafarers as I. Kruzenshtern, Y. Lisyanskiy, F. Bellinsgauzen, F. Vrangel and others participated in the museum collections' formation. Among the objects they brought from their sailings were weapons, boats, minerals, stuffed animals and birds, and so forth. The model workshop opened in the Sea Museum in 1818 became the base for Russian ship modeling development. In 1827 Nicolas I ordered to abolish the Sea Museum, as the Emperor considered it to be useless and uninteresting. The museum collections were transmitted to the Academy of Science, the Cadet School, and the Admiralty. Anyway, in 1867 the museum was revived. Its' collections were formed out of the Model Chamber exhibits and items found in the Admiralty, sea arsenals and storehouses. The exposition included new weapon types, ship models and drawings, sea equipment. In 1908, when the birthday of the museum was solemnly celebrated, it was given the name of its' founder, Peter the Great. After the Revolution of 1917 the collection of the museum was enlarged considerably due to the expropriated collections. A lot of exhibits connected with the royal family and famous aristocratic families were destroyed as not corresponding with the new ideology. In 1924 the museum got its modern name — the Central Naval Museum. In 1939 the Central Naval Museum was given one of the most beautiful buildings in the city — the Stock Exchange House. The Stock Exchange, the focal point of wonderful architectural ensembles of the Spit of Vasilyevsky Island, was constructed in 1805-1810 by celebrated architect Thomas de Thomon. The building is decorated with allegorical sculptural compositions: Neptune with Two Rivers and Navigation with Mercury and Two Rivers. They underline the connection between the Stock Exchange House and sea trade. The main exposition of the museum enlightens the history of the Russian navigation and Russian Fleet from the ancient time till nowadays. The visitors can learn about the creation and history of Russian navy, the most important naval battles that brought the glory to the Russian Fleet, geographical discoveries, circumnavigation and celebrated expeditions, the creation of the missile atomic navy in the USSR in 1965-1975. The exposition ends with the exhibition devoted to the state of Russian Navy nowadays. In all, the Central Naval Museum stocks more than 8,000 items. 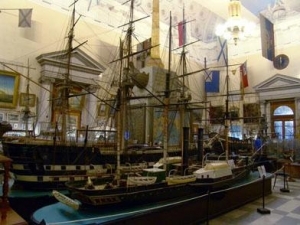 Among them there are models of ancient and modern ships, navigation tools, patterns of weapon and equipment, maps, photos, flags and banners, war booty, personal belongings of the famous Russian navigators, rich collections of paintings and numismatics. The museum features paintings by such artists as I. Aivazovsky, A. Bogolubov, L. Caravaque, W. Huckert and others. The oldest exhibit displayed is the ancient dug-out the archaeologists date back to the 1st millennium B.C. The museum treasures «The grandfather of the Russian Fleet» — the famous vessel of Peter I.